Ok let’s talk about a touchy subject. It seems to me if one was to take a poll nearly 95% of people would like to lose a few pounds at least. I would also wager that the majority of those folks would like to do it primarily for looks. The other day when I was talking to a friend of mine about wanting to lose some weight she looked at me like I was crazy. Yes, I’m thin. I’m about 5’3 ish and I tend to hover right around 118 lbs. I had my BMI tested a while back and I think it was 19-20% (although accuracy of test to be debated). I told my friend that I wasn’t really going to try to lose weight to be skinner or more attractive (funny how those two seem to be synonymous to most women) I want to be faster. Duh. She didn’t believe me. After lecturing and berating talking to her she finally came over to my side. I think. So by losing 5 extra pounds of junk in my trunk I could potentially run 4 minutes and 22 seconds faster?! I’m a skeptic by nature, but that could very well be the difference between getting that sweet coveted BQ and narrowly missing it. And…there is no real work to put in. I mean the manhattans and gin&tonics might have to be my meal replacement for calories sake but that sounds fine. Sign me up, along with Tommy Cruise and Scientolgy. Too good to be true? Is it that easy? Will it work? 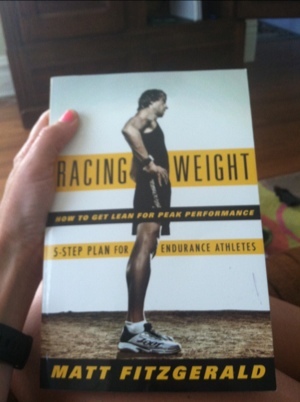 Have you tried a “racing weight? Giving up gluttony, possible? I feel like I am forever chasing that elusive 5-lb. weight loss. That said, I do feel like I run and race better when I am leaner. On the flip side, I sometimes feel like I am less likely to get injured when I’m not as lean as possible (probably in my head). I do know, however, that our VO2 max goes up as weight goes down, so that’s nothing to sneeze at. Argh! I definitely averaged faster miles when I weighed about 10 pounds less than I do now. But I was also younger. Anyway, I should probably clean up my eating to better fuel my running and maybe I’ll lose a few pounds as a byproduct of that.